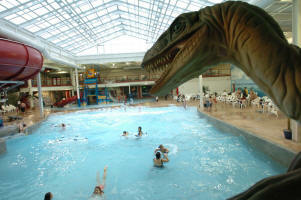 Idaho's first indoor waterpark will take you back -- way back -- to when dinosaurs ruled the waterslides. The retractable roof is opened during warm summer days, so do pack your sunscreen (as you always should, even for indoor parks). The park -- which is available to day guests (call ahead to make sure) as well as overnight guests offers a wave pool, a children’s lagoon, an indoor/outdoor Jacuzzi, and three water slides. The longest -- Lost Falls -- covers nearly 400 feet of banked slipping and sliding. Velociraptor Vortex drops you into a swirling bowl. Prehistoric Plunge is a 300-foot long hish-speed body slide. Body slides have a 42-inch height requirement while the tube slides have a 48-inch heigh requirement (unless riding with an adult on a double-tube, that height minimum is just 42 inches). Online deals to stay at Raptor Reef's hotel? Just click here.